Market Basket workers demonstrated at a job fair for potential replacements in Andover last week. Market Basket workers don’t have a union. But they achieved in three weeks what few unions have accomplished in recent years: They stood up to their multibillion-dollar employer, won local and national sympathy for their struggle, and stayed united. In one of the highest-profile worker movements in years — and in one of the most union-friendly states in the country — organized labor is on the sidelines. The job actions at Market Basket demonstrate the power and voice that employees can have when they unite for a cause, but the high-profile drama is a highly unusual case in labor relations, specialists said. It may be difficult, they add, to draw many conclusions for other workers across the country who are struggling for better wages, working conditions, and benefits. 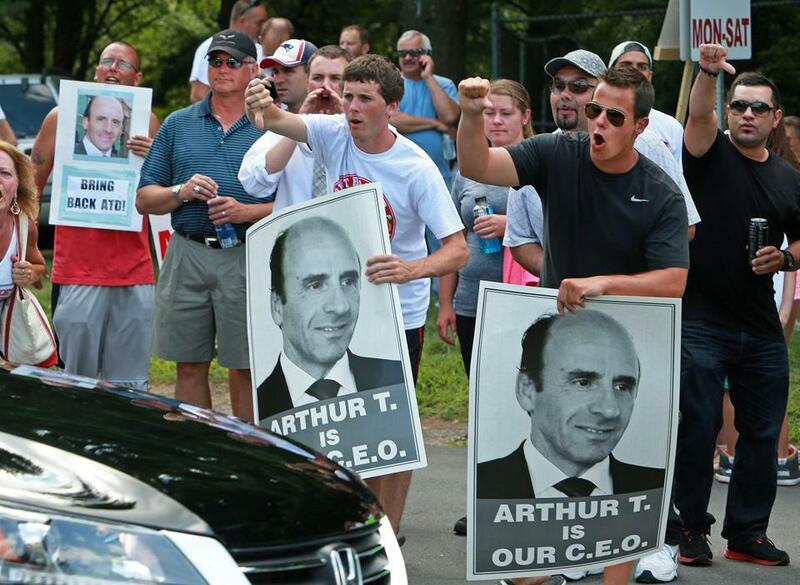 Analysts also note Market Basket employees have not achieved their central demand: the restoration of their ousted boss, Arthur T. Demoulas, as president of the company. As the walkout stretches into its fourth week, the financial risks and pressures on workers and the broader movement only intensify. The decision last week to cut back hours for part-time employees — and consequently, their paychecks — could open fissures between part-timers and their more senior full-time co-workers. Many of the workers have said they fear that without Arthur T. at helm, their decent wages and good benefits will disappear. This job action is not about management demands to roll back wages, eliminate traditional pensions in favor of 401(k) plans, or cut health benefits — issues that can divide employees with different ages and pay tiers. There is a single focus: restoring Arthur T. as head of the company. He was dismissed in late June by the company’s board, which is controlled by his archrival and cousin, Arthur S. Demoulas. The fight also has involved nearly the entire 25,000-person workforce, from cashiers to store managers. Usually, when front-line workers walk out in protest, mid-level managers take over, doing the work and buffering the company’s bottom line from potential financial losses. But in the Market Basket fight, the company’s managers — from high-level supervisors to directors and department heads at individual stores — have been a key force in the protest movement. They have helped organize the rallies and demonstrations, encouraged customer boycotts, and supported lower-level workers. Nelson Lichtenstein, director of the Center of the Study of Work, Labor and Democracy at the University of California Santa Barbara, pointed out that national labor law bars managers from participating in unions. “Here you have an example of the advantages of not being within the law,” Lichtenstein said. A more conventional labor protest took place at a Market Basket competitor, Shaw’s, in 2010, when unionized warehouse workers struck for four months over pay and health benefits. The result was much less damaging to Shaw’s. That chain’s managers hired replacement workers and were able to keep the stores open for customers. As the cost to families and finances mounted, some striking Shaw’s employees crossed the picket lines. Ultimately, the union settled for a deal that was comparable to the one it had rejected earlier. A 2012 strike at Caterpillar Inc. had similar results. Union machinists at an Illinois plant walked off the job after the company demanded a wage freeze and benefit cuts, despite the heavy equipment maker’s strong profits. Less than four months later, they returned to work and agreed to most of the company’s demands. Nationally, the number of strikes has plummeted, from 317 in 1973 to just 15 last year, according to the US Department of Labor. If the Market Basket action succeeds, it may offer worker movements a sliver of hope after a series of defeats, Rosenfeld said. “The situation seems to be unprecedented,” he said. “It’s still very early,” he said, noting that union actions can go on for months. But now a downside to the revolt has emerged: Thousands of Market Basket workers are not going to be paid this week, because their hours have been cut to zero since there is so little business at the stores. The brunt has been felt by the company’s part-time employees, who make up a majority of its workforce. Meanwhile, store managers and their assistants are still at work and are being paid. The longer a standoff lasts, the harder it can be on workers who are going without a paycheck, said Paul Feeney, a spokesman for the International Brotherhood of Electrical Workers, Local 2222, in Dorchester. In 2011, members of the electrical workers union went on strike against Verizon Communications Inc. But they went back to work after two weeks and returned to the negotiating table, eventually preserving some pay and benefits when a new contract was finalized more than a year later. When strikes stretch on, unions may help with funds to aid workers with family and living expenses, but the amounts are usually a fraction of the regular paychecks. Market Basket organizers have set up a fund-raising site that asks workers who are being paid to help support warehouse workers and truck drivers who walked off the job and prevented deliveries of fresh food to the stores, leaving shelves mostly empty. The fund has raised more than $91,000. Audra Makuch, assistant to the regional director for the United Food and Commercial Workers union, said her organization has received phone calls from part-time Market Basket workers who are increasingly concerned they will lose out in this family feud. Feeney, from the electrical workers union, said the Market Basket saga puts companies on notice that employees still have some leverage. the Globe staff contributed to this report. Deirdre Fernandes can be reached at deirdre.fernandes@globe.com. Follow her on Twitter @fernandesglobe.